What a coincidence to discover two fascinating places that are similar but different in the course of two weeks. Kitchentown in San Mateo, California and Smallman Galley in Pittsburgh, Pennsylvania are both culinary incubators. They offer chefs the opportunity to launch a successful business but each takes a unique direction in doing so. These first culinary incubators are a fresh idea, born in the late 20th century from technical incubators. They are rapidly achieving popularity as young chefs, inspired by the celebrity status of Food Channel stars, strive to open their first restaurant. Opening a new restaurant is no small feat today. The required equipment costs are prohibitive and the odds of a bank making a loan that would make it possible to an untried entrepreneur are about as good as winning the lottery. Here's where incubators come in. 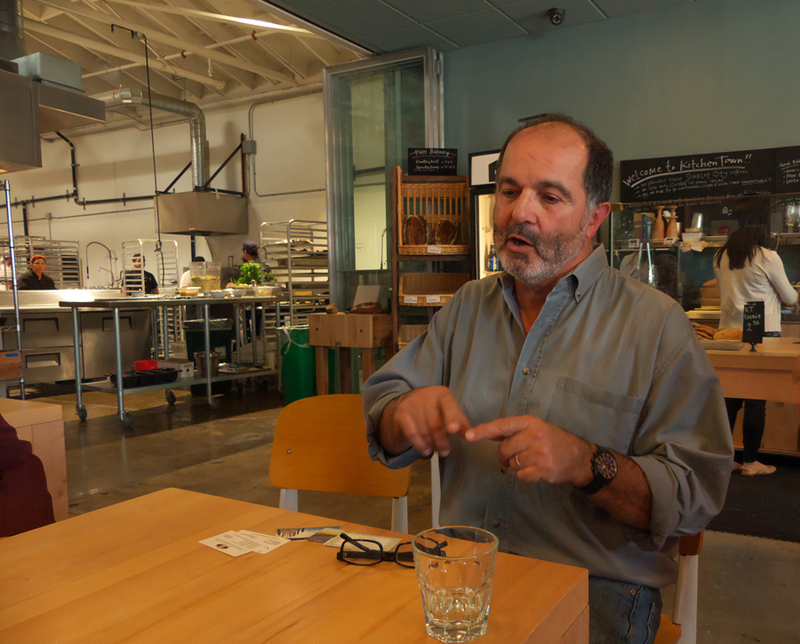 Alberto Solis and Rusty Schwartz launched Kitchentown, Silicon Valley's first culinary incubator, in September of 2014 in a 10,000-square-foot warehouse filled with wonderful natural light. Alberto Solis explains how Kitchentown works. Your nose alerts you even before you enter the door that there is some special food inside. The smell of fresh baking bread, recently ground coffee beans, with an underlayment of spices drift about. 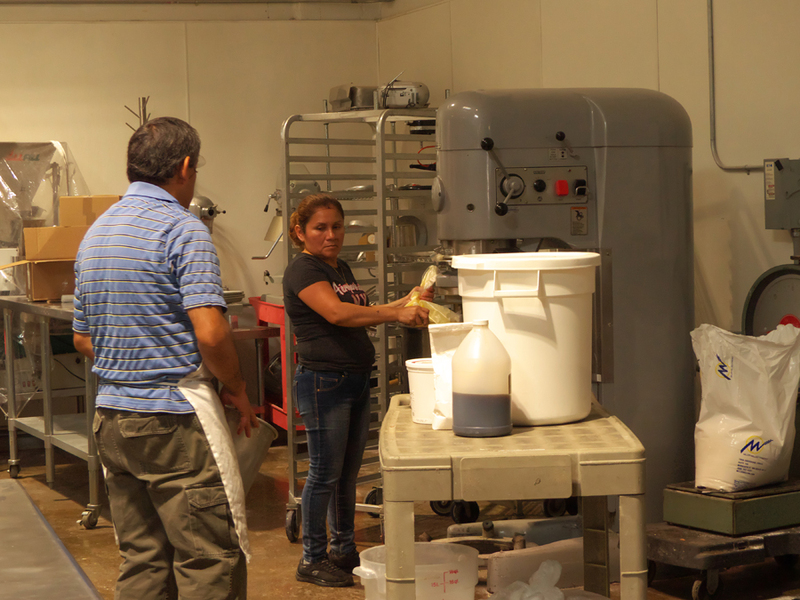 Several people were busy preparing Anna's Cookies, a product Alberto and Rusty inherited with the purchase of the building. Alberto explained one of the benefits of the incubator as opposed to a start up producer trying to make it on their own doing small batches in a home or small restaurant kitchen. "We can bake about 12,000 cookies per day here." Two of Kitchentown's producors creating their own prodcct. Alberto showed us through the facility and explained the procedure, "Everybody has their own pots and pans. We provide the bigger equipment." 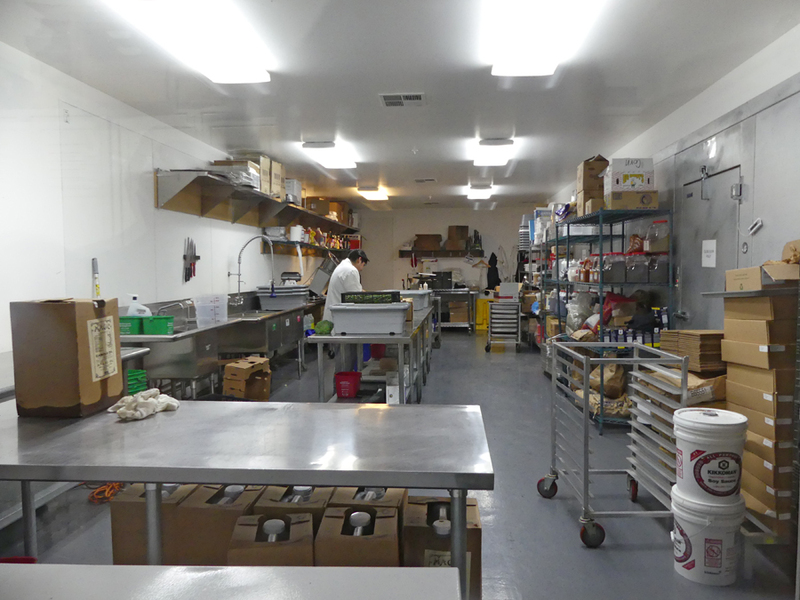 Kitchentown is filled with the finest food prep items, ovens, extruders, mixers, even a special gluten free prep room "That way the producers here can be certified "Gluten Free." Davey Surcamp of Pain Bakery is one example of the kind of producers you find at Kitchentown. He produces organic or sustainably grown wheat breads baked fresh daily on a stone hearth. They are distributed through the San Mateo and San Francisco area. Local Foodz Cali is another Kitchentown producer. They prepare either standard or customized meals that are fresh and healthy. Local Foodz Cali offers "trainer approved" choices you can either pick up at Kitchentown or have delivered. 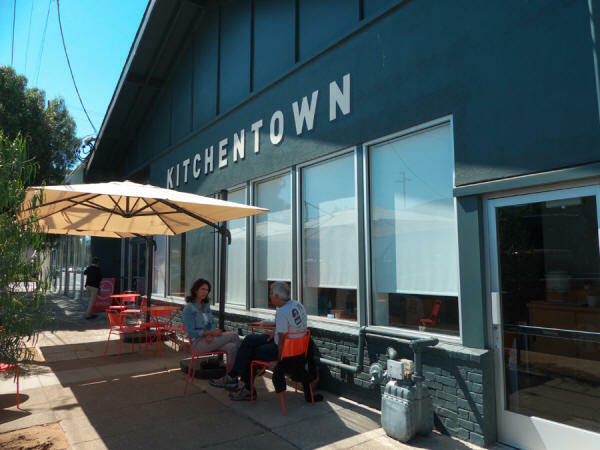 Kitchentown works with producers who want to be able to offer distribution of their product but do not want or cannot afford mass-produced factory-styled products. Kitchentown offers them the facilities to do this while still maintain the highest standards. The help the producers get doesn't stop in the kitchen. There is storage, both walk-in refrigerated and place for canned or baked items and a shared office for taking care of business. 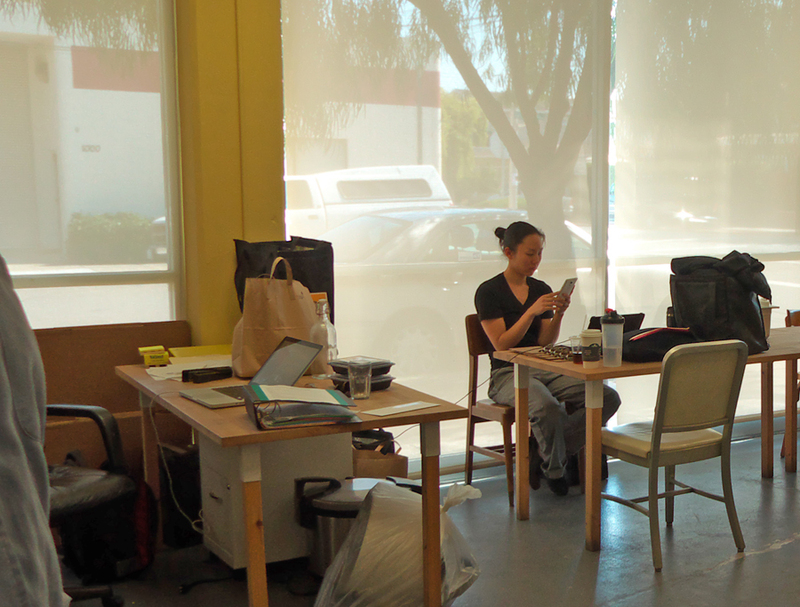 One of Kitchentown's producers makes use of the communal office space. For the diner, Kitchentown is home to No. 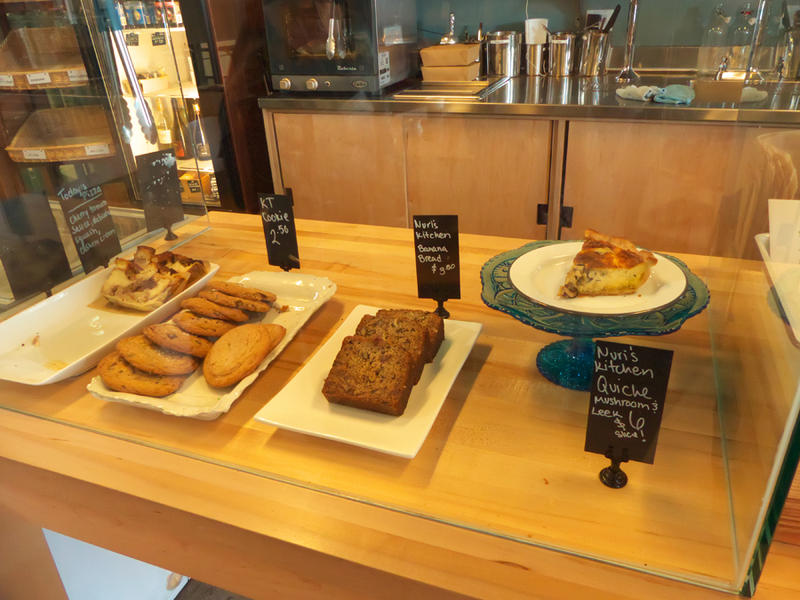 5 Kitchen which features many of its own producers' offerings of cookies, bread and fresh food, juices and coffee or tea. Chef Henry Ng uses organic local farm produce coupled with delicious spices to make this some of the best breakfast or lunch you ever tasted. And while you eat, you can watch the activity going on in the kitchen through the wall to ceiling window between the cafe and the kitchen. You can watch the artisan food makers busy pouring love into their products. Pittsburgh has experienced a food revolution in just a few short years. Two young navy veterans, Ben Mantica and Tyler Benson, grabbed this particular bull by the horns and opened Pittsburgh's first culinary incubator in December of 20`15. Choosing a name was a cinch. 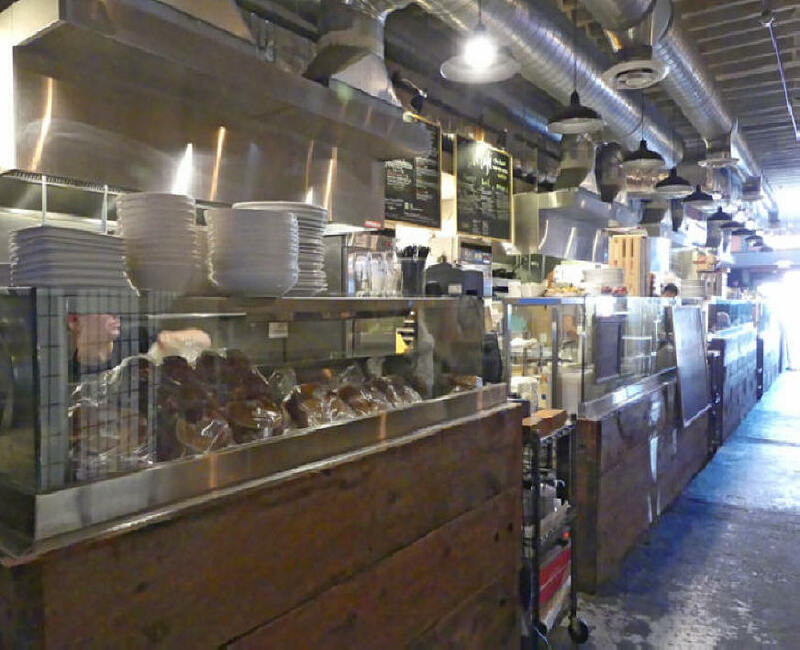 It's located just off Smallman St. in the Strip District and these are Navy lieutenants, thus Smallman Galley. 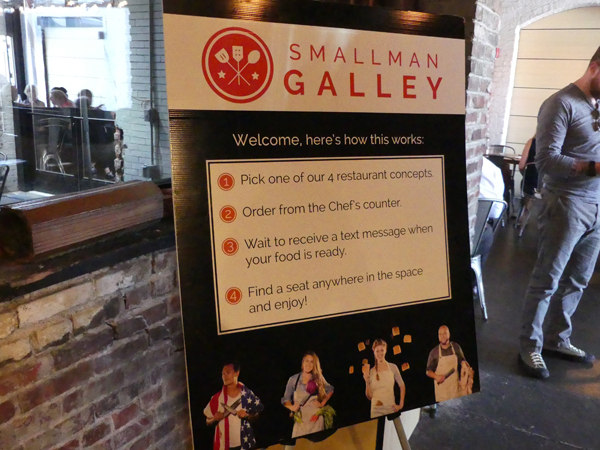 Ben Mantica and Tyler Benson explain Smallman Galley's concept to us. 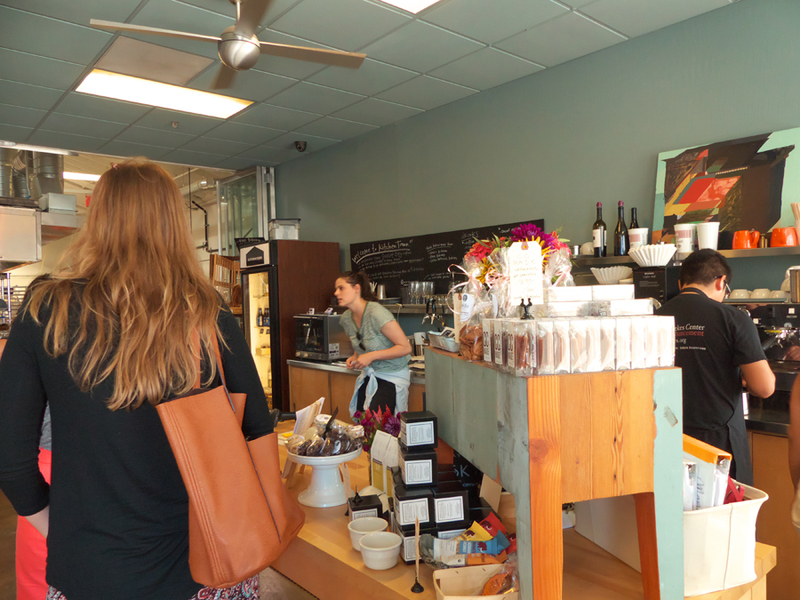 Smallman Galley consists of a a 6,000-square-foot space with a large seating area. To the rear there are four separate kitchens and a central bar area. 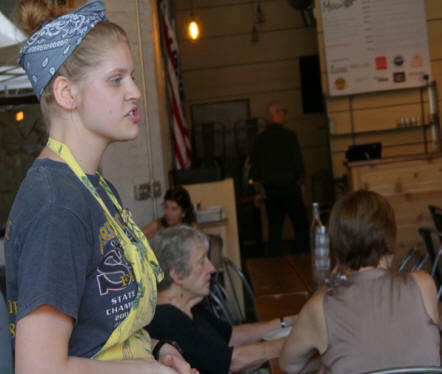 Their first four chefs each earned their spot at Smallman Galley with fierce competition culminating with a judged cooking competition at Pittsburgh Public Market between the top eight chefs. The winners of the cook-off, Stephen Eldridge, Jessica Lewis, Rafael Vencio, and Jacqueline Wardle, receive a kitchen of their own rent free for 18 months. They buy their own food, plan their own menus, and in effect run a small restaurant with no worries about overhead. They get business and management training so they know what to expect when they launch their own restaurants. 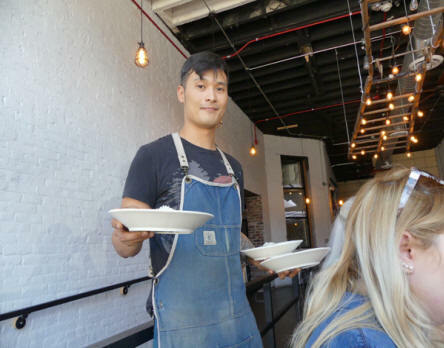 In return, Smallman Galley gets a 30% return on their sales and a 10% interest in the future restaurant these ambitious chefs are going to launch. We then moved to the back of the building to see how the chefs were running their businesses. The four kitchens are identical in design but each chef has introduced small touches of their own personalities in their respective spaces. Each chef is operating with a completely different theme when it comes to food. On one point all chefs agree, they try to source local food. After we looked over the kitchens and the big bar covering the entire back wall, Ben explained the building's style. It was once a tomato processing plant where the tomatoes came in there," pointing out the wide doors, "They canned the tomatoes in the basement. Then before we took it over, it was Headquarters Night Club. The roof was dropped to just above my head. We stripped it down and some of the ceiling looks great." He pointed to a vintage tin stamped ceiling painted black. "The bar was the original one." He pointed to the antique bar against an aged brick wall running the entire length of the building. "The walls were covered with black plywood." Now it has a modern hip look matching the business concept. 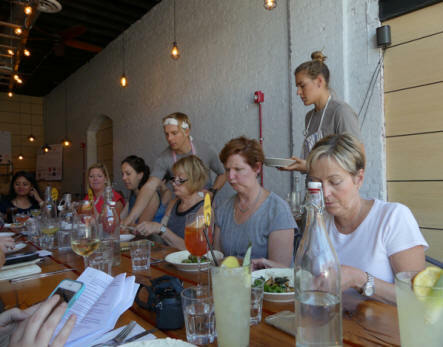 The bar is owned by Smallman Galley and funds the operation in part. 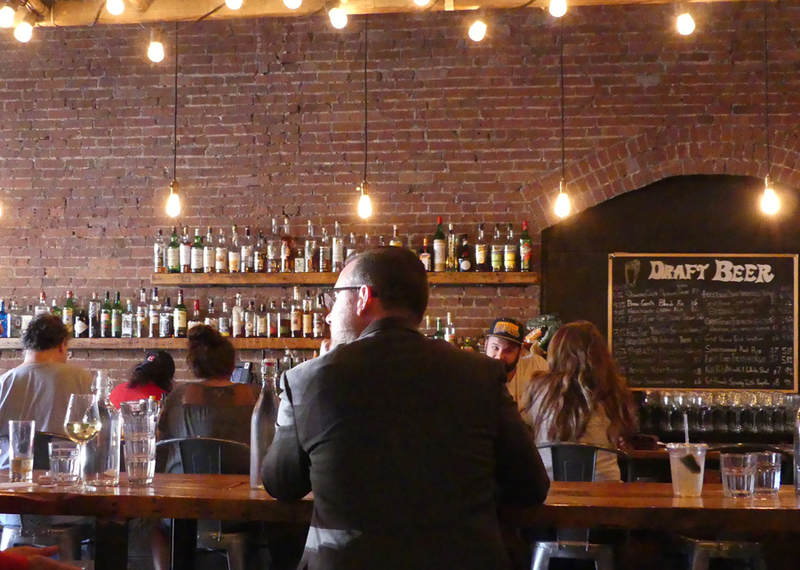 Smallman Galley's bar is great for a enjoyable time on its own or while waiting for your food. Normally you go to the kitchen where you can talk to the chefs and watch them work when you place an order. Since we were a large group, after we visited with the chefs, each served us one of their specials. Chef Jacqueline Wardle, who runs Josephine's Toast, based on her memories of her grandmother serving her toast so often served us a delicious appetizer, toasts with cherry tomatoes and homemade ricotta. It tasted as good as it looked. 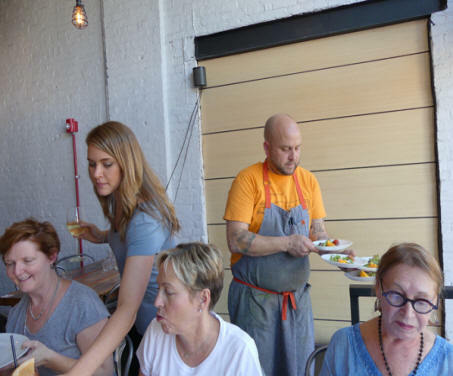 Chef Stephen Eldridge operates Provision PGH. One of his specials is his hamburger. This is not your standard burger. For Eldridge, sustainable food is his main priority. He served us heirloom tomatoes; cashew-tomato vinaigrette; tomato and pickled onion; green tomato jam. Chef Jessica Lewis is a vegetarian's delight. At her Carota Cafe, vegetables play the starring role. She does include meat but it takes a minor part in her productions as in our dish, horseradish gnocchi served pierogie-like. Chef Rafael Vencio's Aubergine Bistro is the result of his travels. He combines classic French, American and his Philippine roots. His homemade eggy pasta with swiss chard and basil butter was a crowd pleaser. The original idea grew from the two seamen's visits to food halls during their navy days. These are food markets offering local food vendors and artisans, usually overseas but now springing up in the US. Tyler commented, "They might have 10 or 20 venders. Food is really high quality. Everybody is sitting together. They are really lively places." 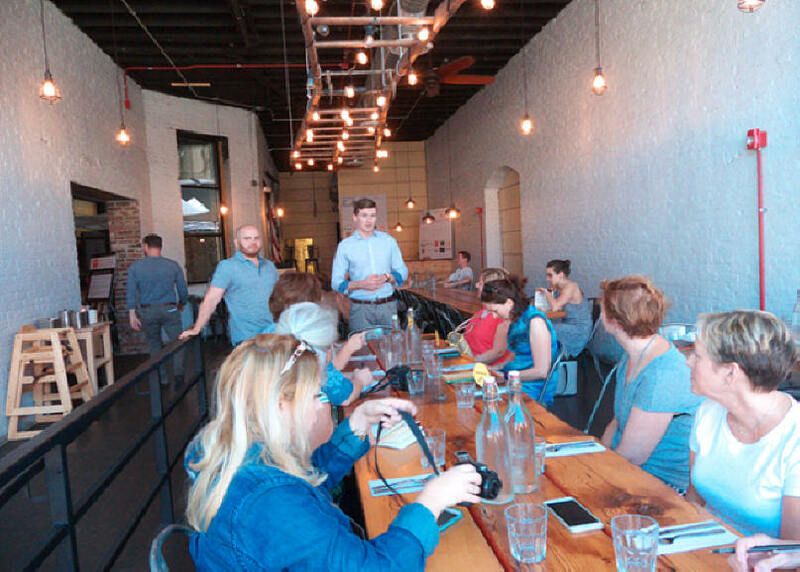 The idea was a good one and Smallman Galley is a huge success including the communal seating. Tyler and Ben had already launched the search for the next chefs when we visited in September. The next group will have a 12 month period. Tyler Benson explained the reasoning behind the Smallman Galley model, "We felt this was something that was needed in Pittsburg… Our talented chefs didn't come here to learn how to cook. They came to learn how to run a business."